Tire pressure is an important part of towing a trailer. My Escalade has a tire pressure monitoring system (TPMS) that constantly monitors each tire. The trailer has no such system. 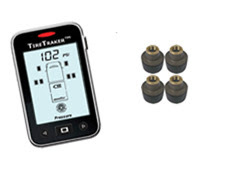 There are several aftermarket TPMS you can get. Based on some feedback from the Airstream forums, I got the Tire Traker TT-500 system. I'll be reviewing it here soon.